The DAX Futures is trading at 11,310.50 with a loss of -0.21% percent or -24.00 point.The FTSE 100 Futures is trading at 7,036.00 with a loss of -0.31% percent or -22.00 point. The CAC 40 Futures is trading at 4,999.50 up with +0.15% percent or +7.50 point . The EURO Stoxx 50 Futures trading at 3,174.00 with a loss of -0.09% percent or -3.00 point. German confidence indicators slowed in November, and that could be bad news for the German and eurozone economies. 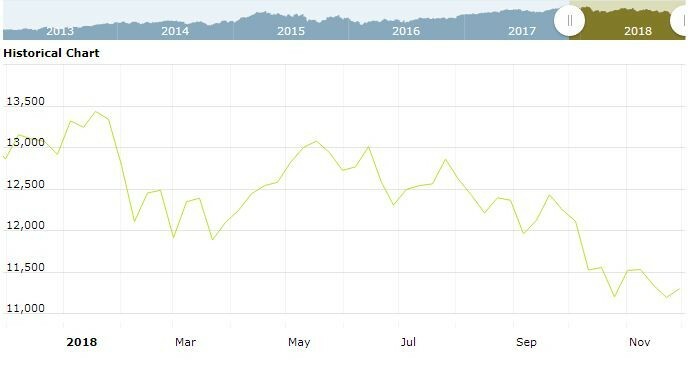 GfK consumer climate dropped to 10.4 points, its weakest level since May 2017. Earlier in the week, Ifo Business Climate dropped to 102.3, missing the forecast of 102.0 points. This marked a 4-month low. The ongoing U.S-China trade war has hurt the German export sector, as German companies that export to both the U.S. and China are now facing higher tariffs. Germany’s economy posted a rare decline in the third quarter, with a contraction of 0.2%. Another problem is lower eurozone growth, as weak economic activity in the third quarter appears to be the story in the fourth quarter. As well, the looming departure of Britain from the European Union and the crisis over the Italian budget have weighed on business and consumer confidence levels in Germany. For the day Germany’s DAX closed at 11,298.23 with a loss of -0.01% percent or -0.65 point.the FTSE 100 closed at 7,038.95 up with +0.49% percent or +34.43 point. France’s CAC 40 closed at 5,006.25 up with +0.46% percent or +23.01 point. For the day the Dow is trading at 25,338.84 with a loss of -0.11% percent or -27.59 point. The S&P 500 is trading at 2,737.76 with a loss of -0.22% percent or -6.03 point. The Nasdaq Composite is trading at 7,273.08 with a loss of -0.25% percent or -18.51 point. In other parts of world, Japan’s Nikkei 225 is trading at 22,351.06 up with +0.40% percent or+88.46 point. Hong Kong’s Hang Seng is trading at 26,534.41 up with +0.32% percent or +83.38 point. China’s Shanghai Composite is trading at 2,588.19 up with +0.81% percent or +20.74 point. India’s BSE Sensex is trading at 36,163.31 with a loss of -0.020% percent or -7.10 point at 12:15 PM.